Few cities can hold a candle to China’s largest city, Shanghai. Millions of tourists flock here every year to sample the glamour and excitement of vibrant Shanghai. As the most populous city in the world, Shanghai is full of excitement and possibilities. It’s a bustling hub of culture, and to scratch its surface is to expose a perfect blend of old meets new. If you want to see Shanghai’s skyline and take advantage of some superb photo opportunities then visit the The Bund. Here you’ll find some of Shanghai’s tallest skyscrapers, including the second tallest building in the world - the Shanghai Tower. Chinese shoppers account for almost half of the world’s luxury goods market, and the trend isn’t lost on Shanghai - the city is a shopper’s paradise. There are loads of designer stores here like Burberry, Gucci and Prada. But if you’re on a budget, head to one of the city’s chic boutiques, high street shops or marketplaces. Shanghai enjoys a humid subtropical climate, and experiences spring, summer, autumn and winter. The hottest month is usually August, with the coldest month being January. Flights to Shanghai run from a number of UK airports. Time your trip right to get an excellent deal. Why not take a look at our range of hotels to find the perfect base for your 2019 or 2020 Shanghai holiday. We offer a range of Shanghai hotels to suit any budget. Whether it’s cheap accommodation or one of the best hotels in Shanghai, we’ve got you covered. If you’re looking for a cheap hotel in Shanghai, the Wyndham Grand Plaza Royale is perfect. With its central location, high quality furnishings and comfortable guest rooms, it’s a fantastic choice for guests wanting good accommodation that won’t break the bank. 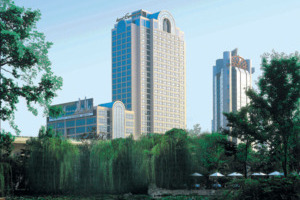 If it’s luxury you’re after, the Le Royal Meridien is often credited as one of the best hotels in Shanghai. Located in the heart of the city, opposite the People’s Square, the hotel features spacious guest rooms with lavish furnishings. Jade Buddha Temple - Built in 1918, this is one of Shanghai’s few active Buddhist temples. Shanghai Museum - Featuring lots of ancient Chinese artefacts, coins and clothes, the Shanghai Museum is perfect for those looking to learn about the history of the city. Get here early though, as only 8,000 people are allowed in per day. Shanghai Tower - View the city from China’s tallest building and get there in the world’s fastest lift at 40mph. Xintiandi - Indulge in some retail therapy in this lively shopping and entertainment district. No matter how you choose to spend your time in Shanghai, you can rest assured that you’ll find the perfect place to rest your head in our range of hotels. Here is just a selection of our favourite and cheapest hotels in Shanghai. Please use our search panel above to find your perfect choice. 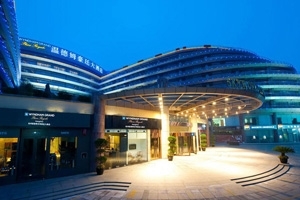 The modern Shanghai Hotel is centrally located in the desirable Jing'an residential and commercial area, within walking distance of Nanjing and Huaihai Road, and close to the ancient Jing'an and Jade Buddha Temples. 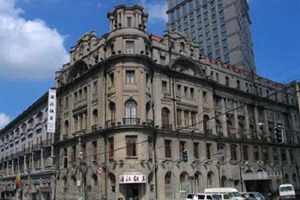 The Bund area is also just a short drive away. The hotel's large rooms are pleasantly decorated ... featuring modern appliances. Amongst the many dining outlets, Bauhinia restaurant is well known in Shanghai for its fantastic "Crystal Shrimp" delicacy. Situated in the centre of the lively Pudong Avenue, the Wyndham Grand Plaza Royale Oriental is a hotel that provides both luxury and elegance to any guest of the metropolis that is the city of Shanghai. Combining high quality furnishings and elegant decor with a sense of sophistication and grandeur, ... the hotel promises opulence through and through, as seen from the lobby all the way to the ballroom and beyond to ensure the best possible experience for all guests. The hotel offers a host of in-house facilities, several speciality dining venues and 523 spacious, lavishly decorated guestrooms and suites, each designed with maximum comfort in mind, and adheres to the needs of its guests with the utmost urgency and attentiveness. Due to the enviable location of the hotel and aside from stunning views the city’s many wonders are easily in reach, so that whether it’s for business purposes or leisure, travellers looking for a slice of Chinese splendour need look no further. 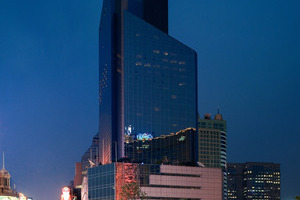 With one of the most enviable locations in Shanghai, Sofitel Hyland is situated at the very heart of Nanjing Road. All rooms have modern decor, and the Club rooms benefiting from an exclusive lounge are well worth upgrading for. This stylish and sophisticated hotel has undoubtedly one of the best locations in central Shanghai, opposite the People's Square. 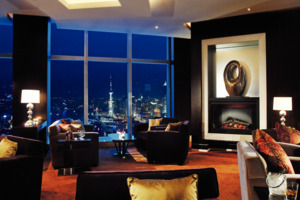 The well appointed rooms provide a great sense of space, with floor to ceiling windows offering views over Shanghai. Take the elevator to 789 Nan Jing Lu Bar and Lounge for ... drinks, music and panoramic views of the city. Deep in the city of Shanghai is where the Astor House Hotel calls home, a well-known, comfortable hotel located to the north side of Waibadu Bridge, close to the confluence of the Wusong River and Huangpu River. The hotel was the first western hotel in China and revels in its ... mixture of both modern comforts and decor as well as the Victorian era architectural aspects of the furnishings and details throughout the hotels rooms and accommodations. Featuring plenty of privacy and space, the grandeur of the hotel is awe-inspiring, with the renowned Peacock Hall which once served as the finest ballroom in the Far East has retained its flawless charm after all this time. Each of the 130 guestrooms and suites are intricately designed to ensure complete comfort for travellers, each with their own individual characteristics, with some rooms sporting contemporary designs and others employing warm, mahogany decor to guarantee an air of classicism. With a host of dining venues and a multitude of in-house facilities as well as nearby city outlets, the hotel is an ideal location for those looking to start and end each day amidst the splendour of the world’s most populous city in the world. Ideally located only minutes to Shanghai's historical district and tourist attractions, the Equatorial Shanghai offers excellent value for money. Guests have a wide variety of food and beverage options to choose from including the Golden Phoenix serving contemporary Cantonese cuisine and the excellent Tomi Japanese Restaurant offering teppanyaki and sushi ... made from the freshest ingredients.